In modern bathroom design there's a growing trend to explore materials not previously associated with beauty and elegance in the bathroom. 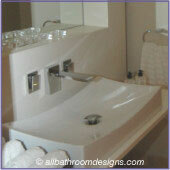 Bathroom designers now utilize "new" materials in innovative and imaginative ways - with stunning results. 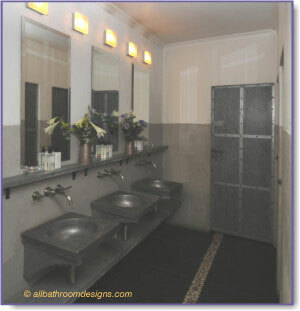 On this page we'll take a look at the use of concrete and metals in bathrooms to add a touch of the unexpected. 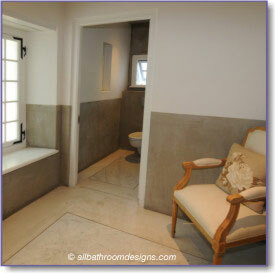 The bathroom in the Jonkershuis on a 300 year old wine estate gets the rough treatment to create style and elegance. The polished concrete floor with marble inlay and the marble vanity tops contrast beautifully with the unfinished concrete on the walls, the white-washed rough wooden roof beams and the window seat - a mix of matte and polished surfaces. Unity is created by keeping to a simple and neutral color scheme, whilst visual interest is created by the use of the different materials. Note the scale of the solid marble inlay on the floor that adds to the sense of luxury. The walls are left devoid of treatment or pictures and the window unadorned. A beautiful setting where the eye is skillfully led to the various elements. 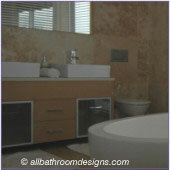 Design Note: Polished concrete is increasingly used in modern bathrooms on floors as an alternative to tiling. It can be stained in a variety of colors and is low maintenance, since no waxing is needed. A variety of objects can be embedded in the concrete, limited only by your imagination. A concrete bath can be constructed in virtually any shape or size to suit your space: Small and deep or double-ended and extra long to allow two people to share a soaking bath. Solid concrete baths require strong floors though to support the weight, so be sure to check with your architect or structural engineer first. Industrial-style chic adds an element of fun and the unexpected - key elements in modern bathroom design. Contemporary design does not disguise materials to pretend what they are not and metals are being used for more than just faucets, towel rails or light fittings. 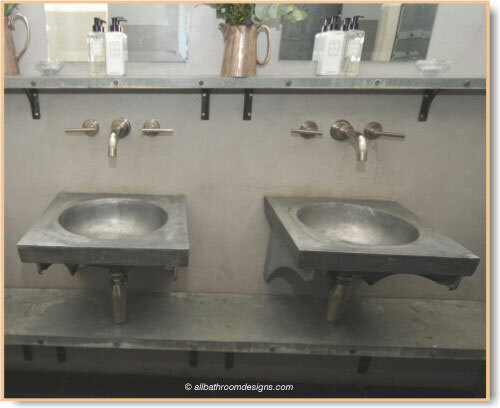 The characteristic mottled look of galvanized metal for the shelves is left untreated and recycled aluminum can be used to cast unique basins. Doors are clad in galvanized metal and "decorated" with bolted on steel trim. The bottom half of the walls are left as unfinished concrete to set off the slick industrial style of the various metal fittings and fixtures. The pebble inlay in the slate floor introduces a surprise element. Note though how the linear placement matches that of the steel shelves above and below the sinks. It is important when playing around with different materials, that there is still unity in the design, rather than random placement of elements, hoping that it will all come together. PS: We had the pleasure of sharing a bottle of their 2005 Cabernet Sauvignon with our meal - its divine! 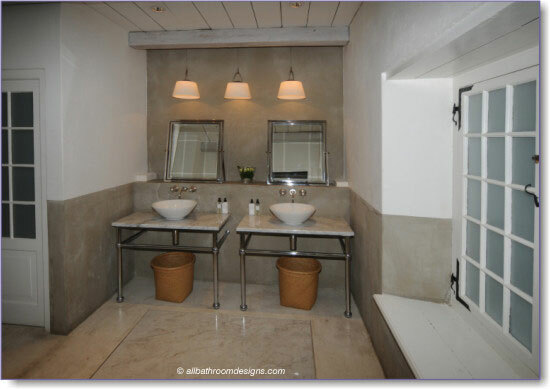 Contemporary bathroom design and the use of modern or even industrial materials is not just for the ultra-modern home or apartment as is evidenced in these two bathrooms on an old wine estate. We hope the bathroom pictures and designs on this page will inspire new bathroom decorating ideas and the use of materials you would not previously have considered in your modern bathroom design!